Global mega-sporting events specialist Losberger De Boer said it has won a major contract from the Saudi government to build the temporary structure for the inaugural electric Grand Prix which kicks off at Riyadh City Race Circuit next week. 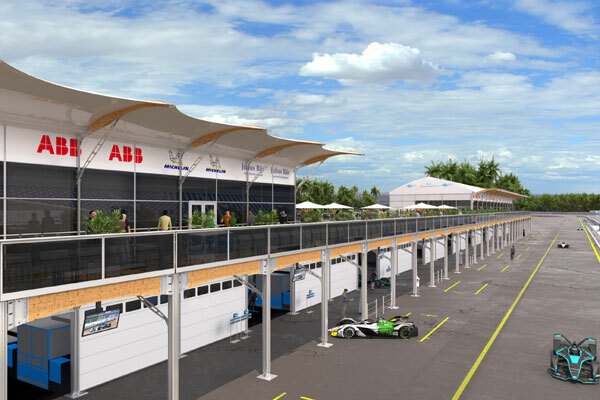 As per the deal, the international temporary structures specialists will build the 190-m-long pit lane along with second floor hospitality and viewing facilities. The build site located in Ad Diriyah, the historic centre of the Saudi Arabian capital, faces an existing public road that will be closed for qualifiers and race day between December 12 to 15. On the contract win, Paul Machin, the senior sales manager at Losberger De Boer Middle East, said: "Functionality and delivering an optimal viewing experience are key concerns for the organiser, so in light of this we were pleased to be able to deliver our Emperor and Premier products using ISO 14001 environmentally-certified processes." "This ensures the needs of the planet are carefully balanced with delivering optimal race day performance, while providing an unrivalled visitor experience for guests," he stated. “Critically, our team follows a carefully planned project management process to ensure tight build and dismantling times are met. Since the race track is located in the centre of a busy working city, our team works hard to keep disruption to local residents and businesses to a minimum - this is an area of expertise for Losberger De Boer,” concluded Machin. With close to 700 projects every year, Losberger De Boer also delivers the world’s largest temporary event overlay for the bi-annual Farnborough Airshow in the UK and installs temporary structures annually at the largest global trade fair, Bauma, in Germany. Last year, Losberger De Boer also built the Middle East’s largest temporary exhibition hall, Bay X, at King Abdullah Economic City in Saudi Arabia besides setting up the Baku City Race Circuit event overlay for a major international Grand Prix motor sports racing event in Azerbaijan, said the statement from the company. A major player in the global sports circuit, Losberger De Boer delivers bespoke turnkey temporary structures for events and commercial usage at any location and has been operating in the Middle East since 2000, it stated.